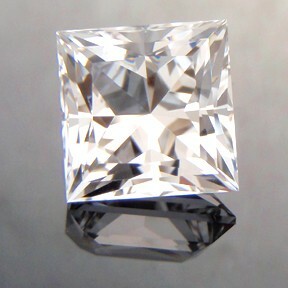 Comments : A bright silvery topaz cut in the traditional Princess Cut design. 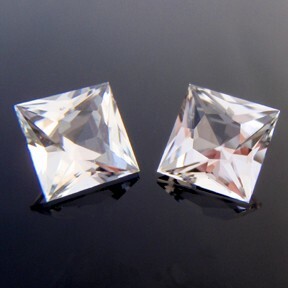 Comments : These two silvery bright topaz are a matched pair and would ideally suit a pair of earrings. 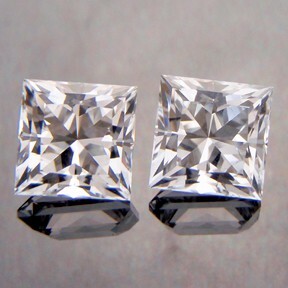 The design is the traditional Princess Cut and performs well in topaz with much sparkle and fire. 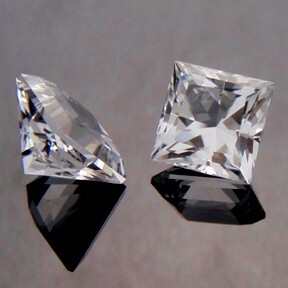 Comments : A lovely pair of matched O'Briens Creek topaz. 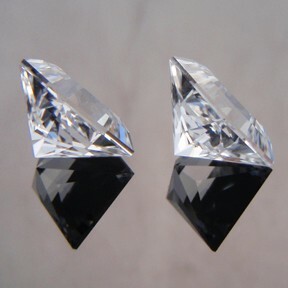 They would make a wonderful pair of earrings. 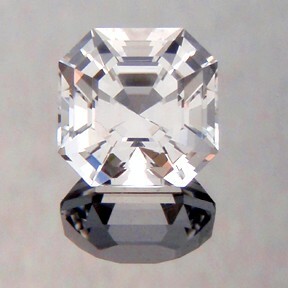 The design is a variation of the "Princess" cut. 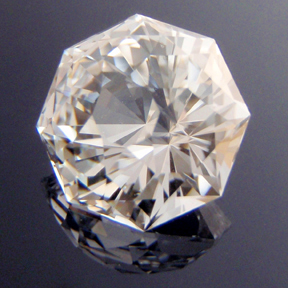 Comments : This is a fine O�Briens Creek topaz hand dug by the cutter. 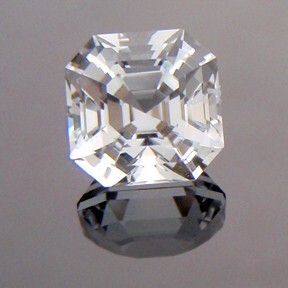 It is cut in the classic Asscher Cut design and looks absolutely fabulous. 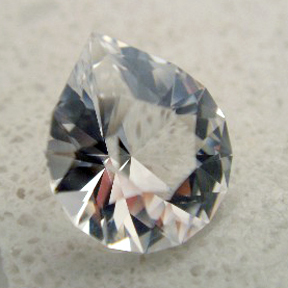 It is silvery white and very bright with no visible inclusions or flaws. 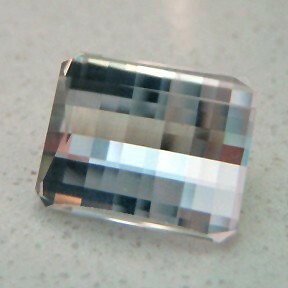 A very nice asscher cut topaz gem! 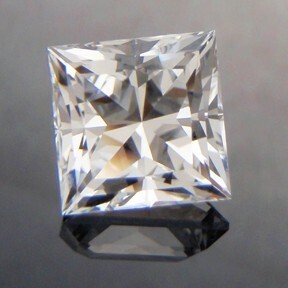 Comments : A fine silvery white topaz in the classic Asscher Cut design... you'll think this was a diamond. 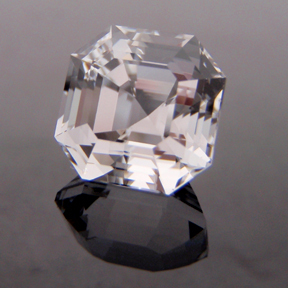 Comments : A flawless eye clean O'Briens Creek topaz cut in the Egyptian Asscher Cut design. This has a nice sharp symmetry and performs well. The black that you can see in some of the photos is simply a reflection of the camera lens which, funnily enough, is also black. 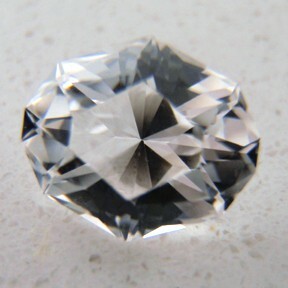 There is no black in this gem... it is a bright silvery white. 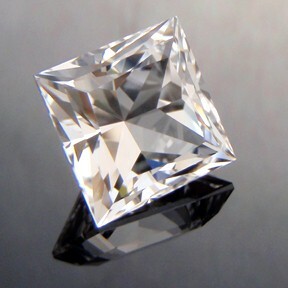 A very nice gem! Comments : This design shines in it's simple elegance. When I first cut this design it instantly became one of my favourites. Its simple but just looks so good. 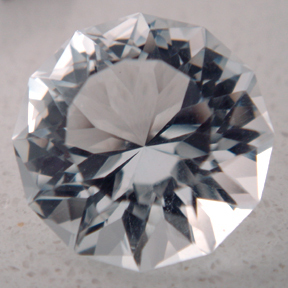 It portrays Yin-Yang on the crown with one frosted and the other polished. It creates a swirling "fan" effect and reminds me of the riflebird when it does its courtship dance, in the manner of how the feathers spray outwards as it curves its wings upwards. 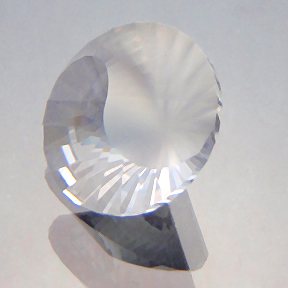 It is very bright and the frosted effect of Yin creates a dynamite gemstone. 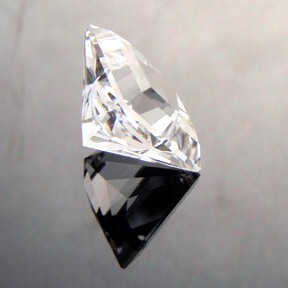 Comments : A nice clean flashy O'Briens Creek topaz cut in a modern Smith Bar design. 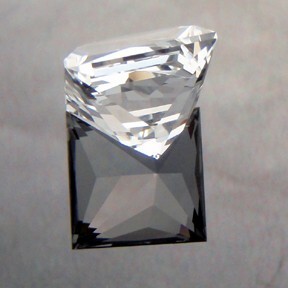 Comments : This is a very nice guerrero topaz cut in a classic design and shape. Guerrero topaz is quite hard to get hold. 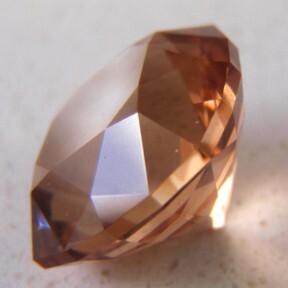 The colours in this gemstone are bronzey-orange peach and is very lovely to see. Comments : A sparkling clear white gem. 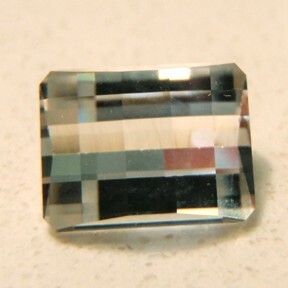 The cut really suits the topaz from this locality. 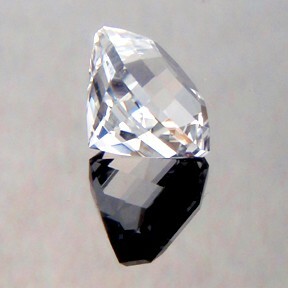 There is a very fine needle that is common for topaz that come from here (this can be seen in some of the photos). It is not noticeable face up. 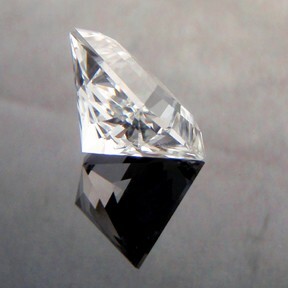 Rather then detract from the beauty of this stone, it add a uniqueness and identifies this stone as genuine. This will be a fantastic ring stone. A good size. 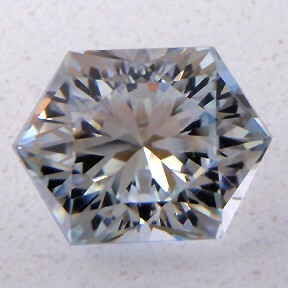 Comments : A nice topaz cut in a design which has a swirling, moving appearance to it. 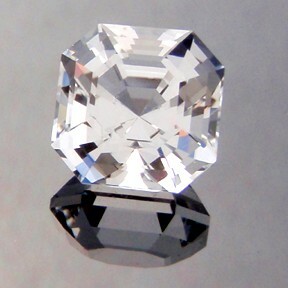 A good size for a ring. The excessive black you can see in the photos is from the camera. 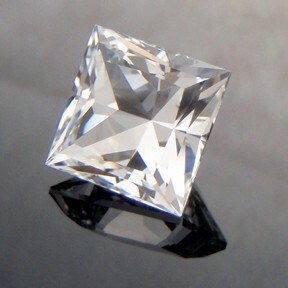 The stone itself is clear and "white". Comments : Very nice Mt Surprise Topaz. The design is quite interesting and a good performer with lots of sparkle. This is a good size for a ring and would be very pleasing to wear. There are a couple of very fine needles which are not noticeable face up and do not detract at all. Comments : Another of my own designs. 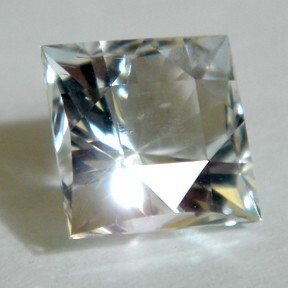 This clear topaz is cut in an octagon dome. This is something that you won't see everyday. 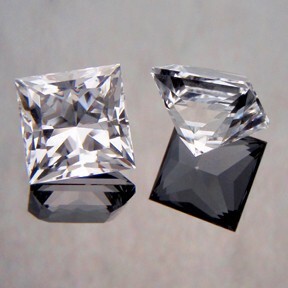 I designed this cut as a ring stone. It performs extremely well and is very brilliant. 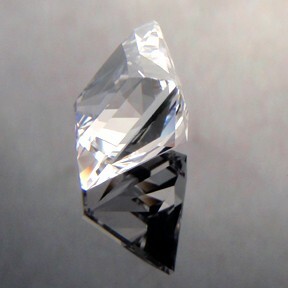 Comments : A nice clear O'Briens Creek topaz cut in an slightly elongated hexagonal design. Very brilliant with lots of life.